Here is a quick guide for how to make giant craft stick snowflakes. These large snowflakes would be so festive and fun on display in your home! They are quick and very easy to make. This would be a great project for teens or tweens to try over the Winter break. My kids enjoyed making these snowflakes as part of an “Elf Bootcamp” for the holidays and I love how they look in our kitchen and living room! Festive, frugal, and fun!! Before you begin (optional), paint the craft sticks or you can use colored craft sticks to skip this step. On a large, flat surface arrange the craft sticks into your design to form a snowflake. I started with a basic hexagon shape and worked from the inside out. Begin gluing the craft sticks into place. Hot glue works best, but quick drying tacky glue will do the trick if you are working with young kids. Allow the glue to dry completely and display proudly in your home! 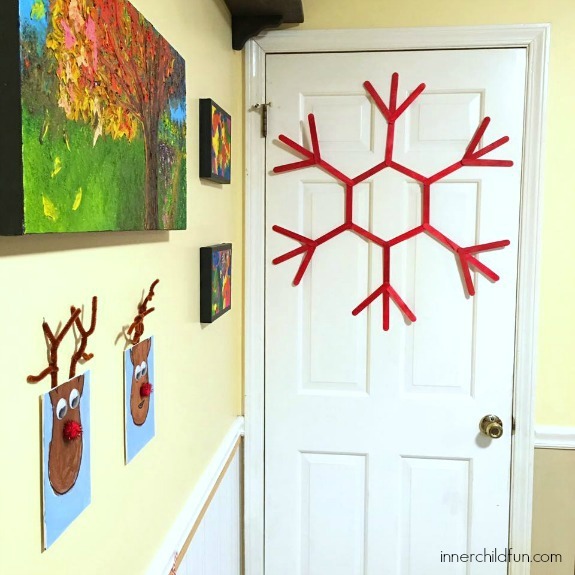 We chose to hang our giant craft stick snowflakes on the wall in our kitchen and living room using these removable hooks. I love how festive they look!